With readership trends undergoing significant evolution, magazine publishers and catalogers needed innovative solutions to help them save money on paper and greatly improve their bottom line. Develop a diverse range of complementary strategies to give publishers and catalogers greater paper choice and flexibility while simultaneously reducing cost and improving efficiency. Outsourced inventory management—JP Gould establishes and manages entire paper purchasing programs for clients. We buy and own the inventory and contractually supply the stock, as needed, through our worldwide distribution network. This program takes paper-related expenses off the customers’ books and helps them improve cash flow while speeding production. Alternative sourcing—Where we see clear benefit, we also offer clients lower cost paper options and alternatives. 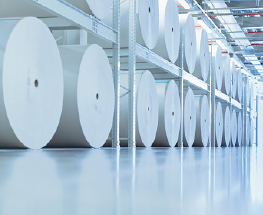 Our teams work to understand client needs and production requirements to suggest different options for paper grades, basis weights, brightness, gloss, smoothness, fibers—any variable factor. These strategies are helping clients produce more, spend less and better control paper costs overall. In addition, we continue to work with publishers and catalogers to seek even more creative solutions to help them meet the challenges ahead.